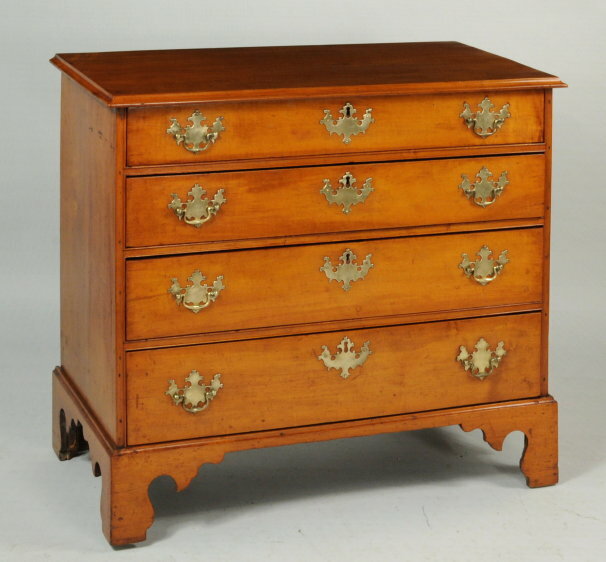 Fine maple chippendale four drawer chest, with molded overhanging top above four graduated drawers with carved beaded surround on the case, with original large brasses, raised on cutout bracket feet. Retains a rich, mellow color and good aspect. Massachusetts, circa 1775-80. 37" wide, 35 1/2" wide case, 19" deep, 17 5/8" deep case, 32 1/2" high. Click here for more photos.